St. Petersburg, Russia and the surrounding area offers more than one can easily see in two days. But on our recent Baltic Sea cruise that included the venerable city, we tried to. The Norwegian Star, as does other ships that travel to the area, anchors overnight giving passengers the opportunity to experience a wide variety of activities. There are cathedrals, museums, palaces, and governmental buildings that dot the landscape and boats on the Neva River that give tourists a different perspective on the surroundings. The challenge of seeing this historical city was time-consuming and although we saw everything that we wanted in the two days we were there, there was still a lot more to experience. Although watching numerous videos on the city and country prior to the trip, I still was not fully prepared for the wonderland of opportunities that awaited us. I should have bought a few picture books before leaving, and also a large map of the area. My wife and I had booked a two-day personal tour with Alla Tours. We visited what one could consider the top tourist spots in and around the city. But I need to digress a little. We scheduled the private tour because of my wife’s challenges following a stroke four years ago. We felt that we wouldn’t be able to keep up with a larger group such as those booked through the cruise ship. My wife can cover short distances on foot, but longer distances are a challenge.We brought along a transporter from home for her. It appears we were right in making the decisions concerning the tour and the transporter. The two days were at our pace, but still a challenge. And it was comforting to know that we didn’t have to worry about keeping up with others. We had our own personal tour guide and driver and were whisked across the area in a private vehicle. There’s just too many things to see over a two-day period, but we tried to see them all. We had considered going to a ballet the first night, but after careful consideration, decided to pass on it. We rode on a hydrofoil from downtown St. Petersburg to Peterhoff Palace, which is called the Versailles of the North. 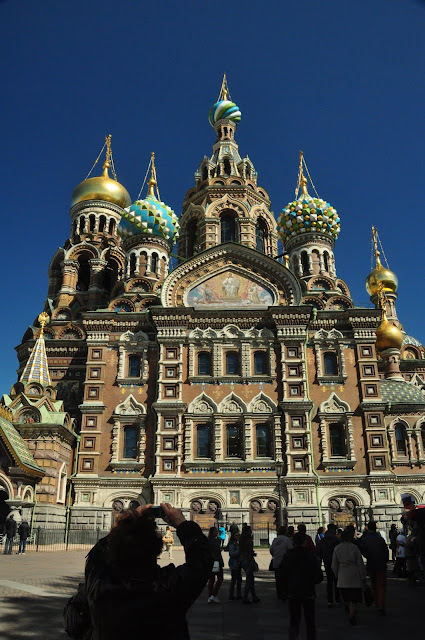 There was the in-city boat ride along the canals and out onto the Neva River, not to mention visiting the Yusopov Palace, Catherine Palace, Church on the Spilled Blood, the Hermitage Museum, St. Peter and Paul Fortress/Cathedral and St. Isaacs Cathedral. And also, a stop for lunch at a downtown diner. 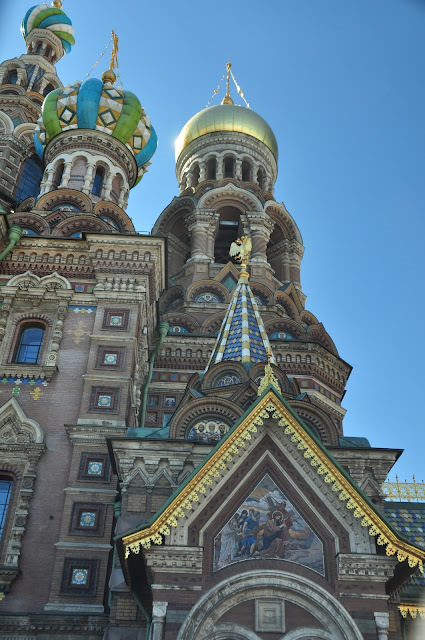 Although beauty abounds in the city, the church name comes from the fact that it is situated on the site where Emperor Alexander II was attacked in 1881 after a run-in with some anarchists. Reports indicate the czar was in his carriage as it passed along the embankment. An ananachist conspirator threw a grenade which exploded near the carriage. Unhurt, the czar exited the carriage and began accosting the suspected anarchist. Another anarchist threw a bomb killing himself and mortally wounding the czar. The czar was taken to the winter palace where he later died. Construction of the church began in 1883 and was competed in 1907. Probably the most outstanding element of the church to me are the mosaics. 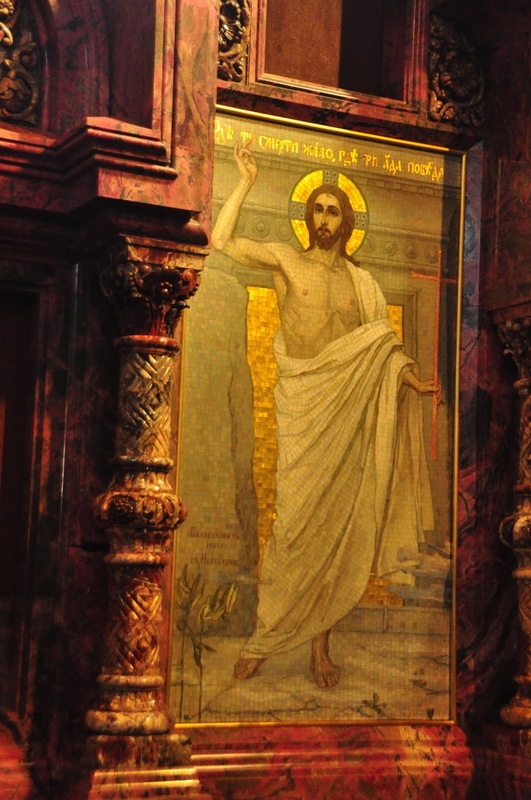 Because painted artwork would not hold up due to environmental conditions, it was decided that the artwork would be mosaics of which there are 7500 square meters in the church. Over the course of its history, the church was ransacked and looted and also used as a temporary morgue during World War II. The structure was also used as a warehouse for vegetables and then later turned into a museum.